In Vibeke Slyngstad’s (b. 1968) suite Modern Classics, architecture occupies a central position. Straight lines and white plastered volumes make up the stage on which Slyngstad performs her inquires into the human condition within modern society. Modernist architecture is more than a style, it is an ideology. Le Corbusier compared the modern house with a machine in which to live – a thought that came to influence heavily the way we rationalized architecture and city planning in the 20th century. Slyngstad seems to draw on this comparison when she chooses modernist architecture as the backdrop and subject for her paintings. We find the people in Slyngstad’s paintings placed in the heart of this clean, rational architecture. As a viewer, we are never quite allowed to meet them eye to eye. In some cases this is caused by a seemingly random, almost photographic, cropping of the image. Elsewhere the human beings that we encounter turn their back at us or they might be pictured at a distance making it impossible to establish contact. The paintings generally convey a sense of isolation brought on by the cold mathematics of the architectural surfaces. Neither do the painting’s few inhabitants give their names to the painting, but the buildings pictured often do. Man is thus subjected by architecture. Nearly as prophetic as Corbusier’s idea of the house as a machine seems today his comparison between the modern house and the film camera. In the ribbon window, he thought, images would replace each other in an animated stream. Today, a majority of our experiences are mediated in some way and the camera often represents the filter through which these experiences first need to pass before they reach us. If we live through the lens, then this is also reflected in our modern architecture. Slyngstad makes a point of this by introducing into her motives reflective surfaces, such as bodies of water, glass or mirrors. To live between these surfaces means to constantly live within a flow of images that are indirectly relayed to us, and the truthfulness of which we have reason to doubt. 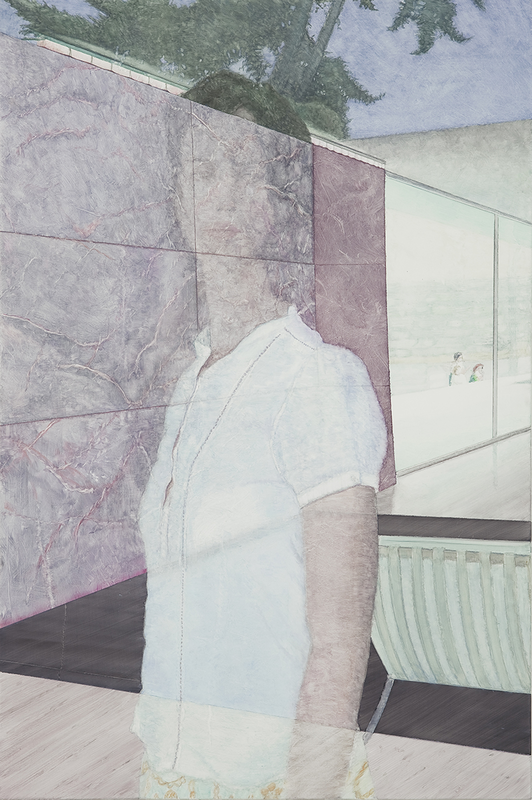 In her latest pieces, Slyngstad expands this theme, including also paintings as a kind of reflective surface. This results in a painting within the painting. An entirely self-referential circle argument would have been established, had it not been for the fact that we are yet again encouraged to question the veracity of these images. The motives of the paintings seem to be to mirror the room in which they hang. But the reflections are corrupted and the supposed mirroring surface open up like windows to another world. There, light bend strangely, colors are intensified and the angularity of the architecture is dissolved. Again, what we see in the reflections does not necessarily simply replicate what we see directly. The logical connection between the picture and the pictured suddenly ends and the rational transitions into the irrational. Perhaps this is Slyngstad’s way of again painting us a picture of man’s role in modern society as a violent and irrational one, locked up in a self-constructed, logically consistent labyrinth. Paintings from the project was shown at the Venice Biennale in 2009. This is the artist’s second exhibition at Christian Larsen.